The western “conquest” Leutze noted was not always peaceful, which is hinted in the painting’s top border, where Indians flee the descending eagle. An official, though incomplete, Army compilation shows 1,065 engagements between U. S. troops (and occasionally civilians) and Native Americans between 1866 and 1891. The struggling wagon toward the back of the picture is a more accurate depiction of westward travel than the jubilant faces toward the top. The most challenging of early overland routes, the Oregon Trail, covered 2,000 miles of barren plain and steep mountains and required 150 to 180 days to traverse. Traffic along the route didn’t really begin until the 1836 party that included missionaries Narcissa Whitman and Eliza Spaulding (the first white women to cross the Rockies) demonstrated the trip was feasible. Just ahead of the wagon train, beneath a shaded cross on the rock, a small group of pioneers buries one of their company. Overland travel was dangerous, as was life in the early West, where medicine and hospitals were in short supply. The portraits in the lower margin represent two phases of America’s westward expansion. Daniel Boone (1734–1820), at left, was already a legend for his explorations in and around Kentucky. William Clark (1770–1838), at right, had traveled with Meriwether Lewis from 1803 to 1806 to map the land acquired in the Louisiana Purchase. The first four acts already past. A diversity of men and women brought the gospel to the Wild West at considerable personal sacrifice. 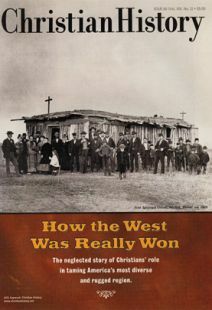 Chronology of key events related to the Christian history of the American west.